Acura is showcasing a new cutaway sketch of the NSX, hand-drawn by famed automotive illustrator Shin Yoshikawa. Yoshikawa’s cutaways represent, in fine detail, the powertrain, chassis, and mechanical components of a given automobile. 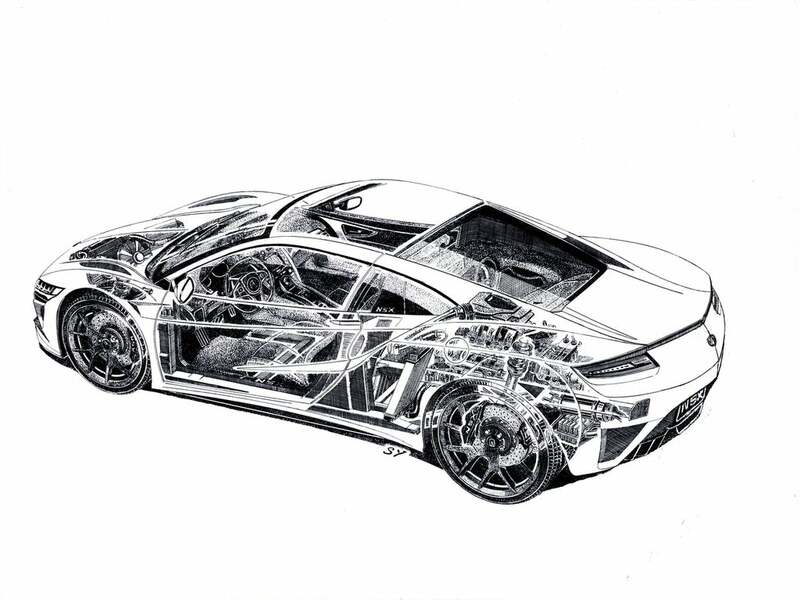 This Acura NSX cutaway sketch took months of perpetration and research, but it was drawn mostly from notes and memory. Which, given the depth of the NSX, is incredible! For reasons like this, Yoshikawa is among the greatest living automotive artists. However, creating this Acura NSX cutaway sketch was hardly a walk in the park. “The NSX’s innovative power unit was extremely challenging to draw, making the second-generation NSX the most difficult vehicle I have sketched,” Yoshikawa explained. 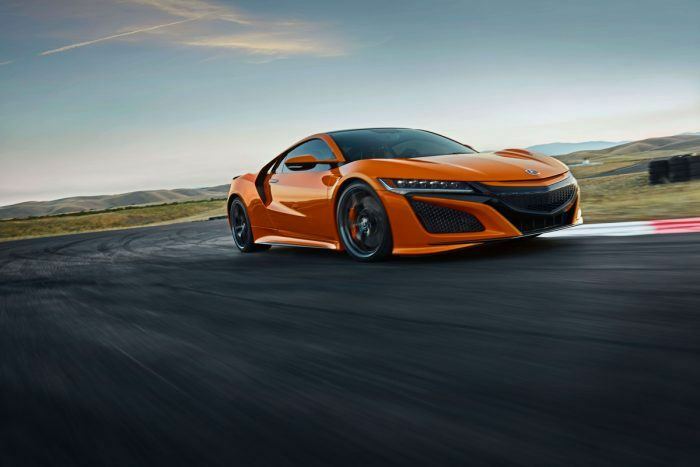 The 2019 Acura NSX produces a total system output of 500 horsepower and 406 lb-ft. of torque. The 24 valve, twin-turbo V6 features forged steel connecting rods, a dry sump system, and cast aluminum pistons with integrated cooling channels. Acura measures the turbo boost at 15.23 psi. With a compression ratio of 10.0:1, the NSX cranks out more than 140 horsepower per liter of engine displacement. 2019 Acura NSX. Photo: Acura. The 2019 Acura NSX made its global debut during Monterey Car Week. Updates include a new body-color front grille garnish and high gloss treatment for the front and rear fascia mesh. A Thermal Orange Pearl paint, an Indigo blue leather interior, and two new brake caliper colors complete the styling treatments. Performance enhancements include stiffer stabilizer bars and new software tuning. Acura says the NSX now has a time nearly two seconds faster around the Suzuka Circuit. Below is a clip of Yoshikawa on Jay Leno’s Garage, along with a full-scale image of his NSX sketch. Yoshikawa has been an automotive artist for the last 50 years. Acura NSX cutaway sketch by Shin Yoshikawa. 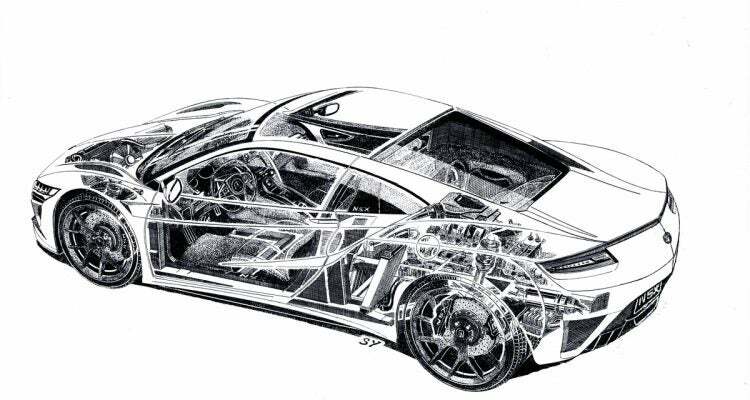 No Comments on "Famed Automotive Artist Draws Beautiful Acura NSX Cutaway"